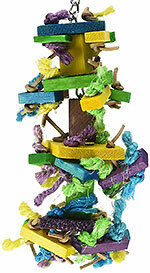 The Knots ‘n Blocks hanging bird toy with many colored wood blocks plus knotted rope is irresistible to parrots. With five unique sizes to choose from, this popular toy provides awesome fun and challenges to every type of parrot from the smallest Budgerigars, through to the biggest, most destructive Cockatoos; and all birds in between. Most toys for parrots don’t come in more than one or two sizes at most. Either you make do with the designed size and adapt it to your parrot whatever the species, or you find another bigger or smaller toy. 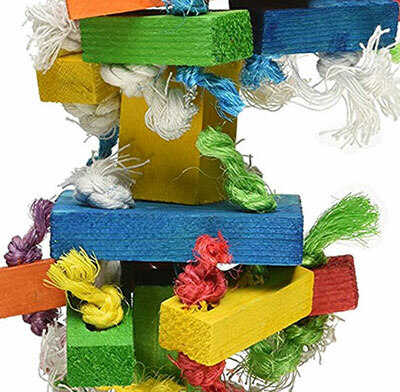 So the great thing about this Paradise wood and rope knots block hanging toy is that you can go straight to the biggest sizes if you’ve got a Macaw or Cockatoo, or select the one that’s just right for a Budgie, Conure, Amazon – or absolutely any parrot. And remember that small parrots can absolutely love big toys as well. Can you imagine a Budgie getting into the X-Large size of this wood block toy! Some birds will go straight for the wood blocks and shred them into toothpicks, while other parrots prefer to undo the rope knots. The knots are holding up the side wooden pieces, so once they’ve fallen to the floor they can be used as fun foot toys. And the chain running through the center of the toy can be re-used if you want to cut and drill your own wood blocks once the toy is destroyed. 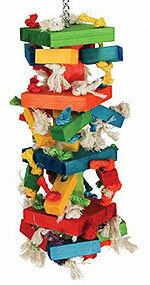 The smallest version of the Paradise Knots and Blocks toy is the only one that has sisal rope only, and no cotton knots. This toy is very small at 10 x 3 x 3 inches and only weighing about 12 ounces. It truly is a hanging toy for the littlest parrots like budgerigars and lovebirds. Larger beaks would certainly enjoy making wood chips out of it fairly quickly, which can be fun for them too if you don’t mind a toy with a short lifespan! 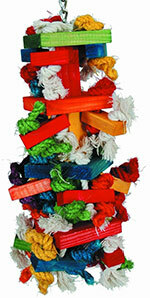 The medium design of the Knots and Blocks toy is 14″ x 6″ x 6″, so double the width of the small version. It has both sisal and cotton knots, plus a good selection of medium sized wood blocks. This would suit small parrots as well as medium sized species like Quakers and Conures. This is where we get into the more substantially sized Knots and Blocks toy – great for small birds because they can climb all over it, but the large size is the minimum one to consider for cockatoos and Macaws. Even though the size is only slightly larger than the medium toy, at 15 x 6 x 6″, it’s the weight of this Large size that makes it bigger and tougher, weighing up to 1.8lbs. The wood blocks are larger are more numerous, which is what makes this toy a lot more substantial than the small and medium sizes. Now getting into the big league, the X-Large is designed to last longer and provide for the biggest beaks. It’s a lot longer than the Large toy above, at 22x8x8 inches, and a weight of over 3 pounds. Big blocks and lots of knots put this squarely in macaw and cockatoo league. That doesn’t mean the smaller parrots won’t love it though; and it can be a very long lasting toy for them. Bird toys don’t get much bigger than this. Large Cockatoos and big Macaws will be in birdy toy heaven with this monster. This is for the biggest beaks (don’t doubt that smaller parrots won’t love it though and it could last them forever). Weighing over 11 pounds and with a length of 30 inches, this is as solid as a bird toy comes. The wood pieces are thick and substantial and will take some time even for the most avid big-beaked chewers to get through. We spend a lot of time reading through hundreds of customer reviews and comments for every product talked about at SafeForParrots.com. If there are any concerns from people who’ve bought the toy, these are noted down. As far as this Knots ‘n Blocks toy goes however, positive sentiment and happy bird and human customers are by far the majority. Some people who were disappointed that the toy only lasted a day or so for their parrot usually bought an inappropriate size; e.g. a small size was purchased for a cockatoo or macaw and the result was, naturally, a very short life span for that toy. One of the larger sizes would have been much more suitable for these parrots. At the other end of the spectrum, many people talked about how long the larger toys lasted – some saying that their bird still hadn’t destroyed it all within a month. It all comes down to the individual parrot, which size toy you choose, and how many other things he or she has to do (plenty, ideally!). The toy is made in China. Whether we like it or not, most parrot and pet toys and products are made in China nowadays. Caitec is the company behind this toy, and they are well known for their commitment to safe, quality pet products. Importers in the USA and other countries who are worth their salt will always ensure that only safe wood, materials and manufacturing processes have been used. And they are the only kind of toys we list on this website. The exact wood type is not disclosed (and likely changes over time as to what’s available during manufacturing), but is possibly a type of pine. An interesting note to read was an African Grey owner who said that the Large size of this toy lasted about 2 weeks, while the X-Large size lasted months. So think carefully about size and how long you want the toy to last before replacing it. Remember, all toys no matter what type, require supervision and maintenance. Some birds will try and ingest rope and fiber so keeping an eye on your bird when they’re using any toy is paramount, as is making sure the toy stays safe, securely hung and untangled until your bird has finished with it and demands a replacement.